I LOVE DEALS… but I love my hair more. Maybe that is why I am fascinated with this new hair mask. I originally bought it because I had a coupon but now I’m hooked. This thing about me and hair mask is I’m obsessed with my hair and it’s the best way to maintain a nearly split-end free mane, especially in the humid and sunny summer months (Yes, humidity is drying to hair – Google it!). So this new miracle hair mask is from Wella Profesionals, meaning you can’t just run to the drugstore and pick it up but there is a reason why it’s worth the trip to a salon (or amazon.com) – Um, It’s amazing! The product is Moisturizing Treatment for Fine to Normal Hair from the line ENRICH. 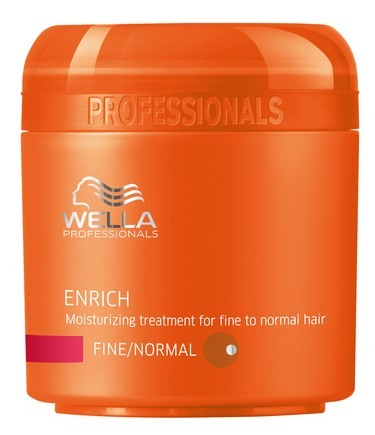 Wella also makes a mask for thick and unruly hair (which I would recommend for ethnic hair, not your average thick-haired girl; it may be over-kill making your main pancake flat). What I love most about the product is its ability to smooth down frizz while maintaining volume and serious shine. Oh, did I mention the effects last. I it used the mask about a week ago and I still feel and see the results. The label says the product is “infused with silk extracts” and the ingredients mention silicone; which I don’t normally like if it’s the first ingredient because then I look at it as the only ‘good for hair’ ingredients and deem the product as a detangler/smoother and not a treatment mask. So, we know that the product is amazing but what do we do about the $11 price tag? I suggest finding your local Wella salon and asking for a sample then if you fall in love with it shell out the cash ($11 isn’t so much for beautiful hair). The container is a little over 5 oz. but if you use it sparingly you can stretch it well over a month, maybe two. It’s a splurge totally worth it, trust me! CLICK HERE to buy the product on amazon.com. To find a Wella salon near you CLICK HERE.